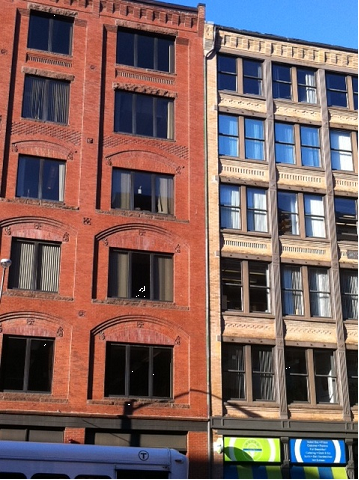 Neighboring buildings on Congress Street in the Fort Point Channel district provide an excellent example of the difference between a façade organized by the logics of an articulated wall and a façade with an expressed frame and infill spandrel panels. Interestingly, both compositions aim for a similar organizational logic – an organizing frame that harks back to the pilaster-and-entablature facades of the Italian Renaissance. In the case of the red brick building, the frame has been created through a selective subtractive operation –the windows read as smaller openings within a larger panel that has been pushed back from the plane of origin. This effect is accentuated by the corbelling at the heads of the arches and bay-scale reliefs. In contrast, the cast iron building goes out of its way to suggest that it has been built up of parts. In both cases, the expression of the facades is relatively “honest” because the skins have real structural work to do – if only holding themselves up, if not structuring the floors behind. As a result, we are seeing the actual transfer of vertical loads as well as the expressive resolution of gravitational forces. 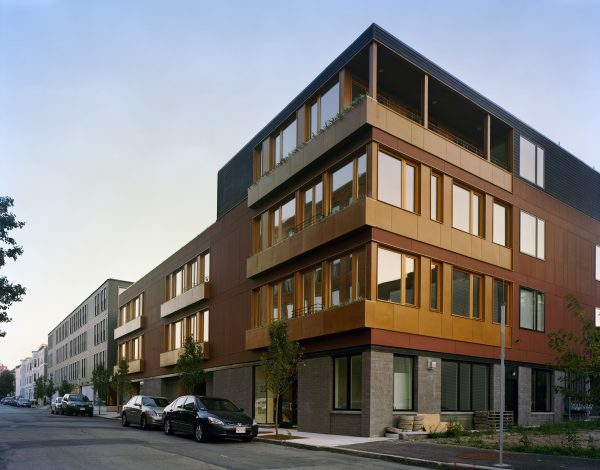 In contrast, all of the buildings on the boards in our office present a very different kind of façade problem because the structure is pushed behind the skin (whether wood studs or a steel frame). As result, the façade is pure cladding – a rain screen (figuratively, if not always literally). As a result, it’s harder to justify the pilaster-and-entablature subdivision represented by the buildings on Congress Street. Instead, we struggle to find other ways to express multiple scales within the cladding systems of our projects.